On Tuesday, June 26th, I had the pleasure of interviewing Claire Ince (the writer) and Ancil McKain (the producer) of Bazodee. 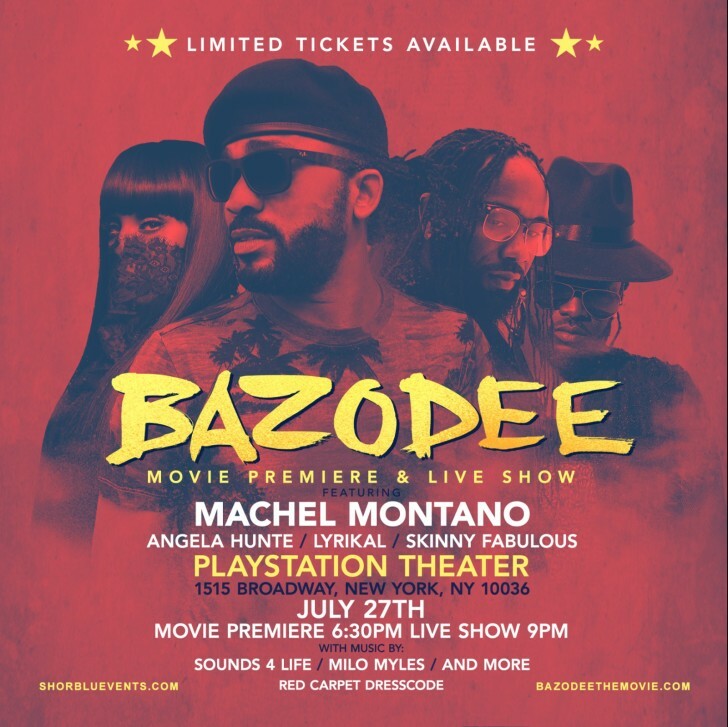 Bazodee is a Trinidadian movie that will premiere on August 5th in theaters nationwide. It is a film that is about the confusion and craziness of love and exploring the fact that sometimes love happens in the most unexpected places and under the most unexpected circumstances […] even if you are engaged to somebody else already. Things happen! Was Bazodee influenced by Mississippi Masala, a movie that came out in 1991 starring Denzel Washington and Sarita Choudhury acted in that particular film? How did come up with the actual title for the film, Bazodee? A follow-up question to that. Are you trying to say that love is confusion? Did you write the script envisioning that the actresses and actors that you wanted for each part? I know that initially you were at Carnival in 2006 and you came up with this idea. But did you have an idea of who you wanted to act in the actual film or did you write the script and then come up with who to recruit for actors and actresses? Well, I mean…we always… of course…uh we wanted Machel Montano […]. The other actors…I would say…we…we had some idea of the type of actors we wanted. Well, Kabir Bedi was ya’ know a great gift for us because he was the essence of that character and he is a brilliant actor with a long and magnificent career…really. But the other actors…we hired a Casting Director in London and we did a search in Trinidad as well. My next question is for Ancil. What attracted you to produce this film? Well, I am…I am from Trinidad and Tobago. That’s where I was born. And…umm…it seems…I always wanted to…to tell a story of kind of who we are. Yeah! You know, the fusion, ya’ know of Indo-Caribbean people and ya’ know African people living in this…in this space getting along so beautifully. Ummm… I always thought we were also…well, I know we were a good example to the world. Ummm…because yeah…I mean we were in a small space but we all got along. Umm…the music is a big factor in it as well. Ummm… that I think is the main reason that we…that I wanted to tell this story. That I wanted to be involved in telling this story. Ya’ know it was just something that should be…I mean we have Carnival ya’ know. We have this coming together… We have…this color. And I mean Trinidad is just really a fantastic place. I know I seem like I am all over the place right now but it is really just a fantastic place to experience if you haven’t, and just this movie kind of tells the story of that. Another question for you Ancil. do you have any upcoming projects in the works? Claire Ince: “I mean. I think one of the things…ya’ know we’re talking. You know this is our first film. We do want to bring some of that… ya’ know… We are from the same place and what we are looking to do is … […] to create entertaining, ummm…audience-driven projects that people come and…and enjoy. And there’s…I just again want to stress that Bazodee is unique because it is a Caribbean project ummm… […] …and we have attracted international talent to do it. Yeah! At heart, it is an authentic Caribbean story. […] So, yeah…ya’ know people will say Hollywood is exploring Carnival but it is actually the other way. We brought Hollywood to Trinidad to make this film. And what you are going to see on screen is that coming together. It’s Ancil who is from Trinidad and Tobago and I’m from Barbados and we came together because we wanted to see a musical tell our stories. And that’s an important part of this thing. I think until we tell our stories… until we are the ones telling our stories…until we are the one’s writing our stories you are always going to get that Hollywood portrayal. So, it is very important for us to tell stories where we are at the center of them. We chatted for a bit and I thanked these two trailblazers for crafting a movie that is laughter-filled, tells the importance of family and shows a bit of the innocence of love that still exists on the islands. If you want to know more about Bazodee, look for my review of Bazodee. Oh, and check out this clip https://www.youtube.com/watch?v=3a-wKnRx1Y0! This is only a bit of the wonder that this movie created!